Earth Day will soon be here - it's April 22nd, 2012. 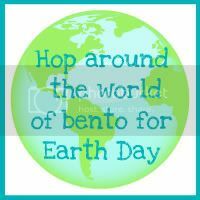 My bento blogging friends are having a blog hop to celebrate Earth Day. It's my first time joining in on a blog hop- woo hoo! 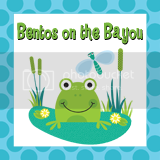 Don't forget to check out the bottom of the post so you can hop on over to the next blog. It's vegetarian. I couldn't quite make it vegan - she really wanted the ranch dip and I could not convince her to switch from a cheese sandwich either. recycle (whatever is applicable in your area - for us it's only glass and tin cans), set the water heater at a lower temperature, wash clothes in cold water, use earth friendly cleaners and phosphate free detergent, pack waste free lunches as much as possible, minimise trash by buying in bulk and reuse packaging materials where possible, take your own reusable grocery bag shopping - not just to the grocery store!, use cloth diapers, compost suitable materials, plant your own garden and farm organically, buy organic produce as often as possible, buy locally produced items including food as much as possible -- reduces carbon footprint due to less transport time, conserve water, don't put harmful pesticides and non-organic fertilizers on your lawn, carpool whenever possible, turn off lights/TV/computers and other electronic devices when you aren't using them, do not leave charging cords plugged in if they are not charging anything - it still draws electricity, keep your air conditioning/heat at a moderate temperature or off, keep harmful waste and batteries out of the landfill (by following your area protocol for disposal), replace all of your bulbs with new low wattage, energy efficient bulbs, replace old appliances with energy efficient ones (as the need arises), eat less meat to reduce your carbon footprint (start small and aim for one meatless meal per week). We could definitely work harder on some of these ourselves such as buying more organic produce; it is so expensive here it becomes difficult. If cost seems prohibitive in your area also, try to at least buy organically for the items on the "dirty dozen" list. Have you planned any Earth Day activities? What can you pledge to do to help our environment? Love to see/ hear how your butterfly garden goes! Your lunch looks great! Love that you included Earth friendly activities in this post! Great ideas! Can't wait to see how your garden grows! Very cute lunch and great post! Love the blackberry tree! how cute!! Thank you for all of the lovely comments! Wow! So many great Earth Day submissions this week. Voting is going to be hard!